Derry City's Rory Holden is set for a move to English Championship side Bristol City subject to a medical. Derry City youngster Rory Holden is currently putting the finishing touches to a two year deal with English Championship side Bristol City, for a undisclosed fee. The 20-year-old, who impressed Bristol boss Lee Johnson during two recent trials, jetted over this afternoon to finalise the deal before tonight’s 11pm transfer deadline in a deal which could net Derry in upwards of £150.000, depended on a number of add-ons. Derry manager Kenny Shiels, while disappointed to lose the talented midfielder, admitted he feels Holden has all the attributes to be a top player. “One of my first games as Derry City manager was an Under 19 game and I identified Rory straight away as a player who I would be expecting to push his way into my first team plans,” explained Shiels. “I felt next season was going to be his real break through year for us but while I’m disappointed we have lost him, I feel it’s a good deal all around for both Derry City and Rory. 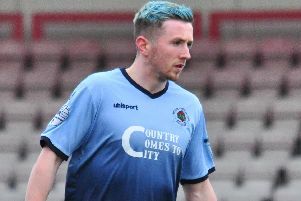 The former Top of Hill Celtic man, who has had 10 appearances this season, scored his first senior goal for his hometown club against Sligo Rovers in July and also forced his way into the Northern Ireland U21 set-up. Holden is the second Derry youngster in recent weeks to get the chance to further his career, something which hasn’t gone on unnoticed by Shiels. Winger Ronan Curtis had looked set to sign for Swedish club Ostersunds before the deal fell through at the last minute after a failure to agree personal terms. “Derry City is a pathway for young players to get a career in the professional game across the water,” added Shiels.